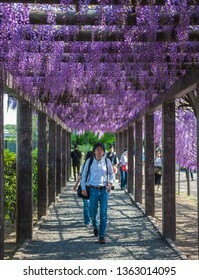 An avid photographer from Singapore. 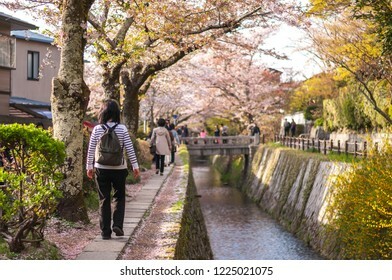 Currently living in Kyoto as a student. 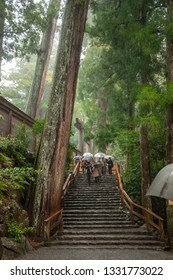 I specialise in landscape, nature and travel photos mainly from Japan. 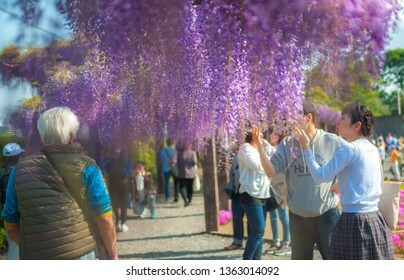 839 stock photos, vectors, and illustrations are available royalty-free. 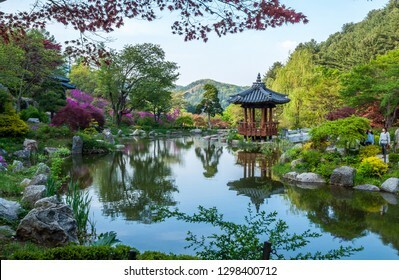 GYEONGGI-DO, SOUTH KOREA - APRIL 29: Landscape photo of a beautiful Korean-style garden pond in the "Garden of Morning Calm", with a Korean-style pavilion on the edge of the pond. 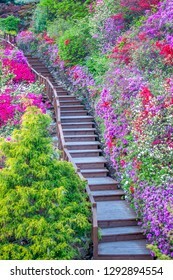 Vertical photo of a long flight of steps with colourful flowers and plants surrounding the staircase steps in South Korea's "Garden of Morning Calm". 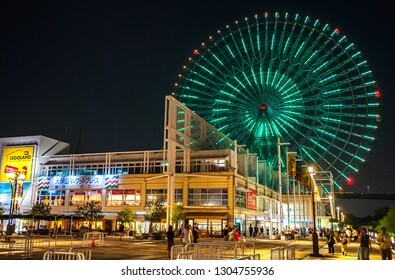 Landscape photo of a field of red, purple and white tulip flowers in South Korea's "Garden of Morning Calm"
OSAKA, JAPAN - AUGUST 14, 2016: Night view of Japanese locals and tourists walking around Tempozan Harbor Village, where the Tempozan Giant Ferris Wheel is located next to Osaka Aquarium Kaiyukan. 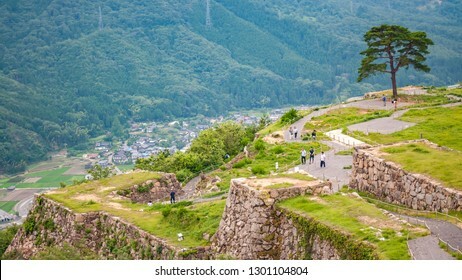 Landscape photo of tourists and local visitors walking around Takeda Castle Ruins located in Hyogo Prefecture's Asago City in Japan, which is a famous and popular side trip from nearby Himeji. 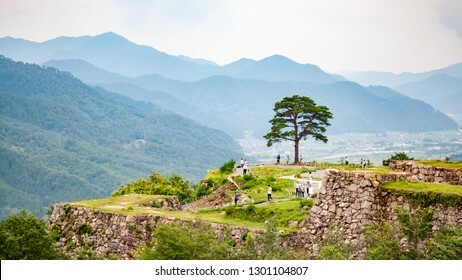 Landscape photo of visitors and a lone tree at Takeda Castle Ruins located in Hyogo Prefecture's Asago City, which is a popular side trip from nearby Himeji, with mountain range in the background. 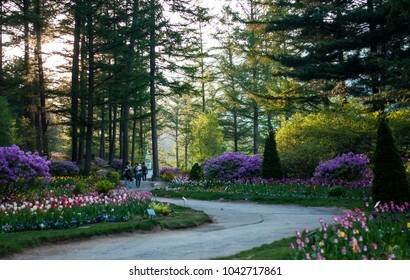 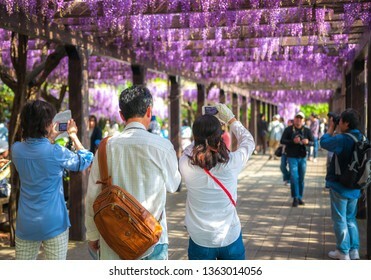 Landscape photo of the "Garden of Morning Calm" in South Korea with visitors walking on the scenic walkway, filled with trees, plants and flowers of many different colours. 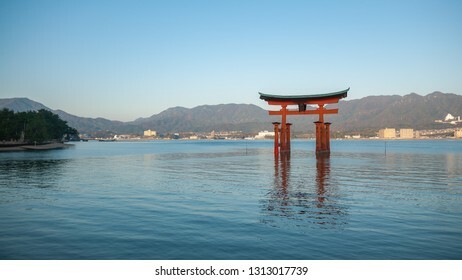 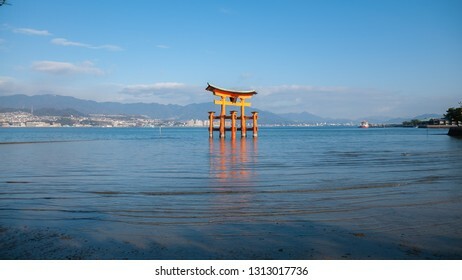 Landscape photo of the famous orange Great Torii Gate of Itsukushima Shrine which seems to be floating in the sea during high tide, located in Hiroshima Prefecture's Miyajima Island. 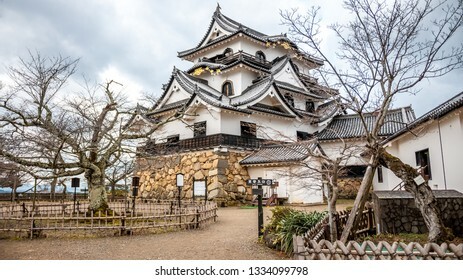 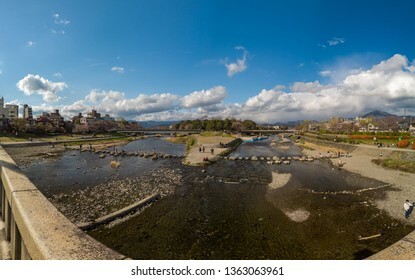 HIKONE, JAPAN - MARCH 10, 2017 : Landscape photo of Hikone Castle, which is a Japanese Edo-period castle in the city of Hikone, located in Shiga Prefecture, Japan. 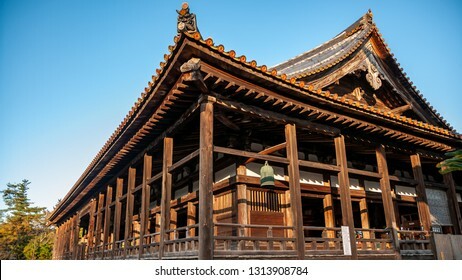 NARA, JAPAN - MARCH 26, 2013: Panoramic view of Todaiji Temple (also known as "Great Eastern Temple"), which is one of Japan's most famous and historically significant temples and a landmark of Nara. 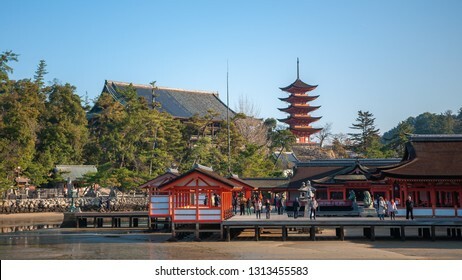 Landscape photo of Senjokaku Pavilion (Hall of One Thousand Tatami Mats), which is the largest structure on Miyajima Island and is designated as a 'Specially Preserved Building' in Japan. 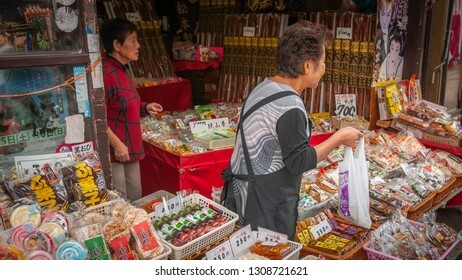 KAWAGOE, JAPAN - OCTOBER 11, 2016: Old, female shopkeepers selling cheap, small sweets, or also known as 'dagashi' in Japanese, in a typical Japanese shop called 'dagashiya'. 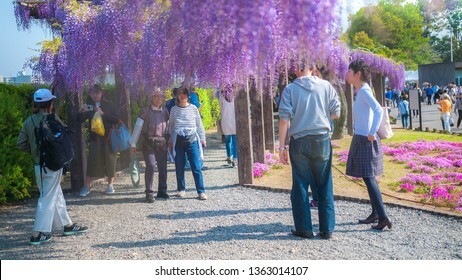 KYOTO, JAPAN - APRIL 8, 2016: Japanese locals walking along 'The Path of Philosophy', or also known as 'The Philosopher's Path' which is a well-known cherry blossom spot in Japan's Kyoto Prefecture. 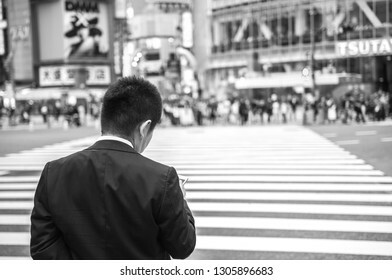 TOKYO, JAPAN - OCTOBER 10, 2016: A young Japanese white-collar worker, also known as a 'salaryman', checking his phone while waiting to cross at the famous Shibuya Crossing. 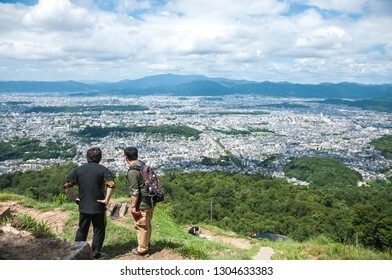 KYOTO, JAPAN - AUGUST 21, 2016: Scenic view of Kyoto City seen from the peak of Daimonjiyama, with two Japanese men looking at Kyoto Imperial Palace, which is situated in a rectangular enclosure. 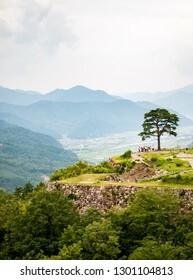 Vertical photo of tourists and visitors and a lone tree at Takeda Castle Ruins located in Hyogo Prefecture's Asago City in Japan, which is a famous and popular side trip from nearby Himeji. 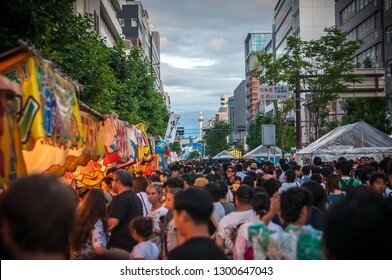 KYOTO, JAPAN - JULY 15: A huge crowd of a mix of Japanese locals and foreign tourists walking along Karasuma street in Kyoto City's famous Gion Festival, with a view of Kyoto Tower in the background. 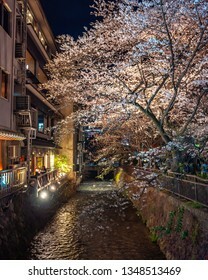 Cherry blossoms at Gion Shirakawa lit up in an illumination event during nighttime, famous for the scenery of a cobblestone path running along ancient town houses and the view of the Shirakawa River. 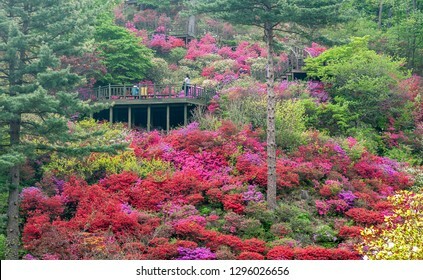 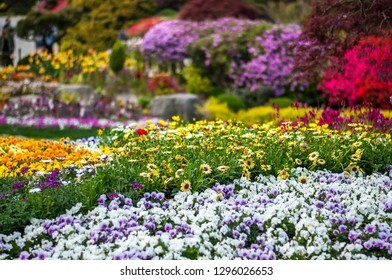 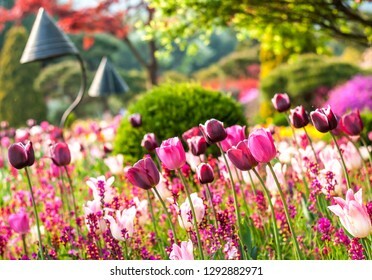 Landscape photo of a wide variety of pretty and colourful flower beds in the "Garden of Morning Calm" in South Korea. 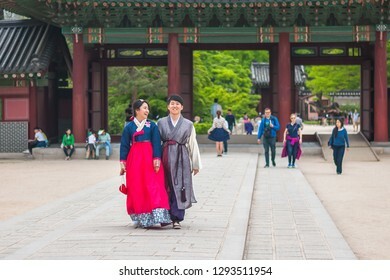 SEOUL, SOUTH KOREA - MAY 1, 2016: A happy-looking and smiling Korean native couple dressed in the traditional Hanbok seen walking around the palace's quarters in Changdeokgung Palace. 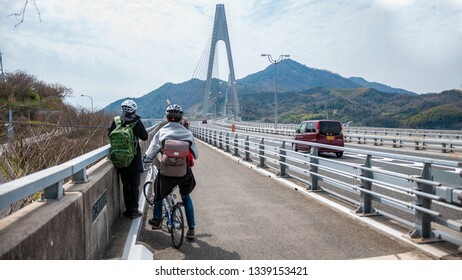 ONOMICHI, JAPAN - MARCH 26, 2017 : Ikuchi Bridge, which connects Innoshima Island with Ikuchi Island, is the second bridge to cross while on the Shimanami Kaido cycling tour starting from Onomichi. 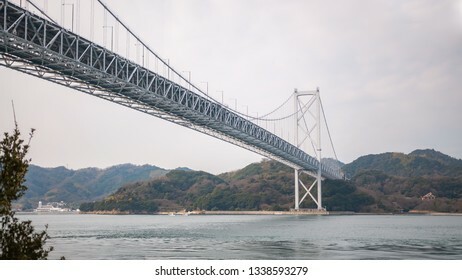 Landscape photo of the first bridge on the Shimanami Kaido cycling route going from Onomichi which connects Mukoujima Island and Innoshima Island in the Shikoku Region of Japan. 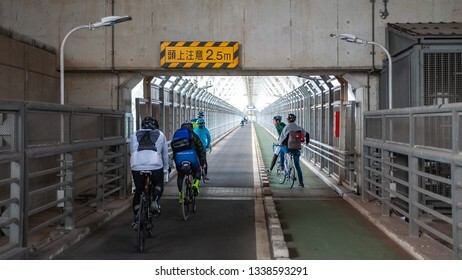 ONOMICHI, JAPAN - MARCH 26, 2017 : Cyclists riding on a bike path that runs under the Innoshima Bridge which connects Mukoujima Island and Innoshima Island as part of the Shimanami Kaido adventure. 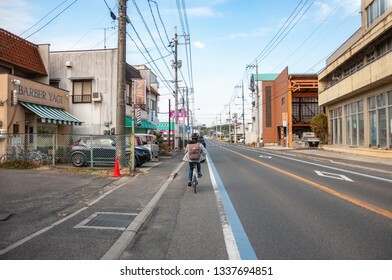 ONOMICHI, JAPAN - MARCH 26, 2017 : Cyclist riding his bicycle past a small town in Mukoujima Island which is the starting point of the Shimanami Kaido in the Shikoku Region of Japan. 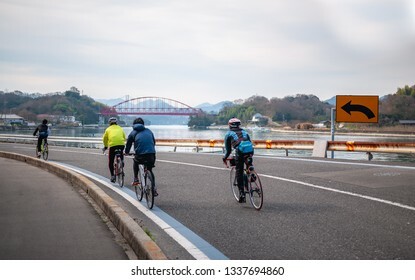 ONOMICHI, JAPAN - MARCH 26, 2017 : Cyclists riding at Mukoujima Island which is the starting point of the Shimanami Kaido, with a red-colored bridge called 'Mukaishimao Bridge' in the distance. 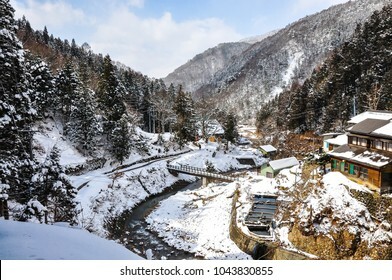 Beautiful landscape of a valley covered in snow at Yamanouchi in Nagano, Japan where the famous 'Jigokudani Monkey Park' is located. 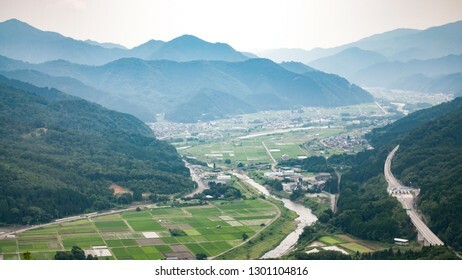 Jigokudani means "hell valley". 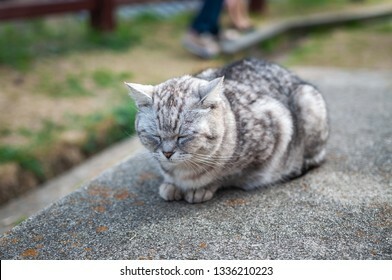 A cat seen on Mt. 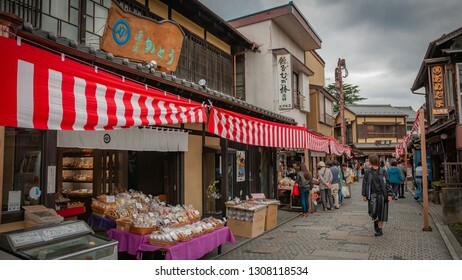 Senkoji's Onomichi Cat Alley, or also known as "Neko no Hosomichi", which is full of loitering cats, located in Japan's Hiroshima Prefecture. 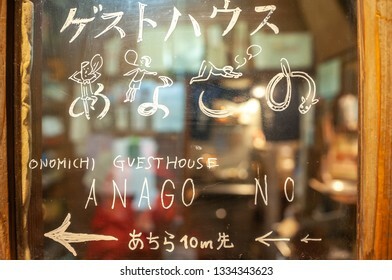 ONOMICHI, JAPAN - MARCH 25, 2017 : A sign drawn by hand on the window of 'Akubi Cafe', directing the way to 'Onomichi Guesthouse Anago no Nedoko', taken in the middle of Onomichi Shopping Arcade. 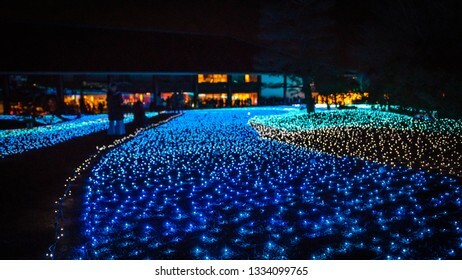 NARA, JAPAN - FEBRUARY 8, 2017 : Visitors enjoying the night illumination event known as the 'Happiness Corridor Nara Rurie' event which connects the representative shrine and temples of Nara. 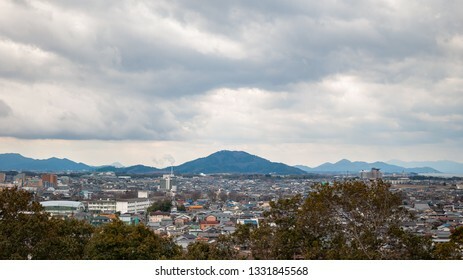 Panoramic, scenic landscape view with beautifully textured clouds that can be seen from Hikone Castle, located in the city of Hikone in Shiga Prefecture, Japan. 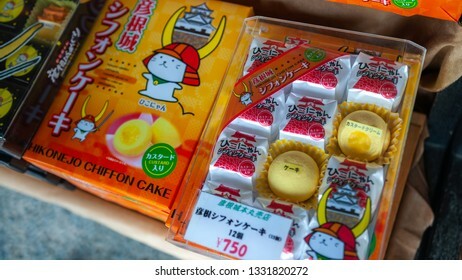 HIKONE, JAPAN - MARCH 10, 2017 : Merchandises of Hikonyan, who is a popular mascot in the city of Hikone in Shiga Prefecture, and he usually makes quite the appearance in Hikone Castle. 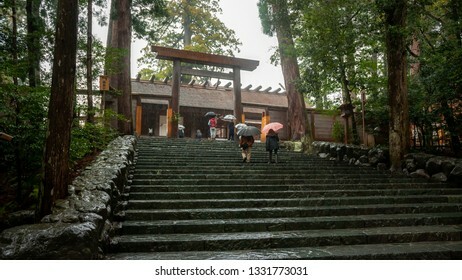 ISE, JAPAN - MARCH 21, 2017 : Worshipers and visitors walking on stone steps leading to the main shrine, called Naiku, in the rain at Ise Grand Shrine, which is Japan’s most sacred Shinto shrine. 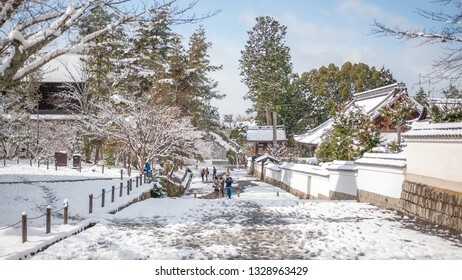 Landscape photo of the beautiful winter scene seen in Kyoto City's Nanzenji Temple in Japan after a rare heavy snowfall during a cold winter. 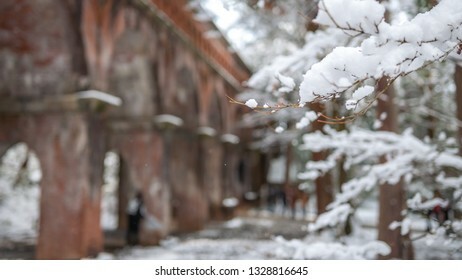 Photo of the beautiful winter landscape at the large brick aqueduct that passes through the temple grounds in Kyoto City's Nanzenji Temple in Japan. 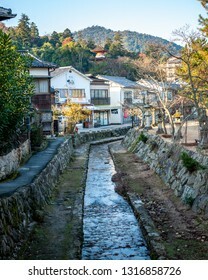 MIYAJIMA, JAPAN - DECEMBER 10, 2016: Vertical photo of a river stream and traditional wooden townhouses, with the top of Tahoto Pagoda visible in the background, located in the famous Miyajima Island. 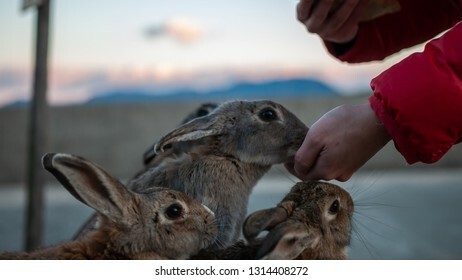 Cute, fluffy wild bunnies waiting to be fed by visitors in the island of Okunoshima, also known as the "Bunny Island", which is a small island located in the Inland Sea of Japan. 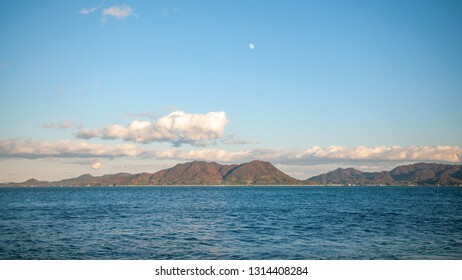 Beautiful nature scene seen on the island of Okunoshima, also known as the "Bunny Island", which is a small island located in the Inland Sea of Japan, with a waxing gibbous moon in the sky. 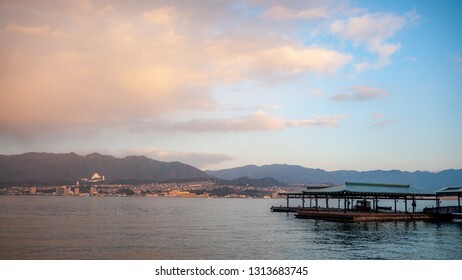 Landscape photo of the beautiful view that can be seen right outside the West Japan Railway Miyajima Ferry Terminal with the jetty in view, during the early morning, with dramatic clouds in the sky. 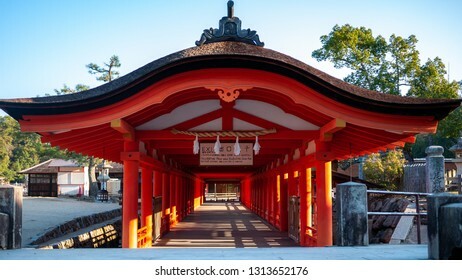 The exit of Itsukushima Shrine with several orange pillars supporting an orange-colored roof in Hiroshima Prefecture's famous Miyajima Island, located in Japan. 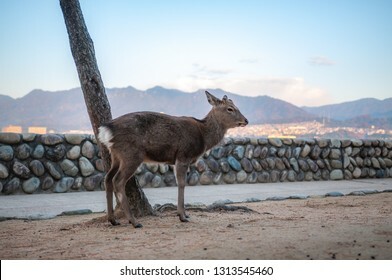 A single deer seen at Hiroshima Prefecture's famous Miyajima Island in Japan where wild deers are considered as sacred by the locals and are free to roam. 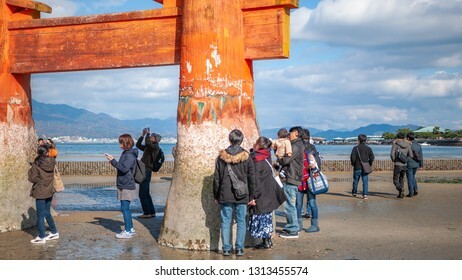 MIYAJIMA, JAPAN - DECEMBER 10, 2016: Landscape photo of tourists seeing the famous torii gate of Itsukushima Shrine up-close during low tide which appears to float on water at high tide. 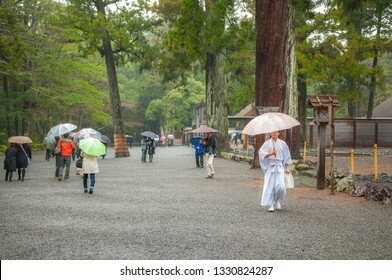 MIYAJIMA, JAPAN - DECEMBER 10, 2016: Tourists walking around at the Itsukushima Shrine, with its multiple buildings, which are connected by boardwalks and supported by pillars. 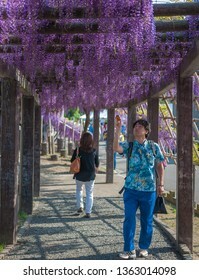 KAWAGOE, JAPAN - OCTOBER 11, 2016: Old clay warehouses and merchant homes which resembles the ones from the Edo-period, with tourists walking around in what is now a famous sightseeing spot. 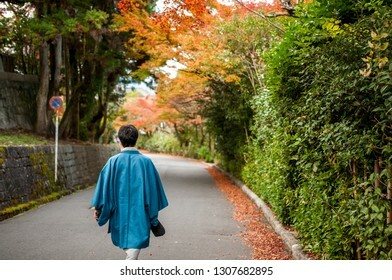 KYOTO, JAPAN - NOVEMBER 23, 2016: Landscape photo of a lone Japanese man clad in traditional kimono walking on an empty street with colourful, beautiful autumn foliage right outside Maruyama Park. 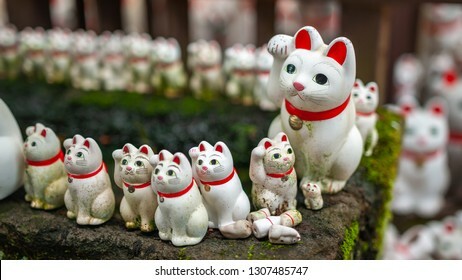 Numerous maneki-neko, or also known as "beckoning cats" which are small statues of various sizes that portray a cat sitting up and beckoning with its front paw, can be seen in Tokyo's Gotokuji Temple. 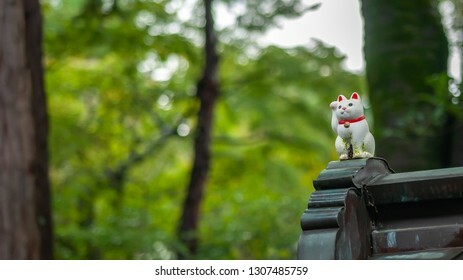 One, single maneki-neko, or also known as "beckoning cats", which portrays a cat sitting up and beckoning with its front paw, in focus with a blurred background can be seen in Tokyo's Gotokuji Temple. 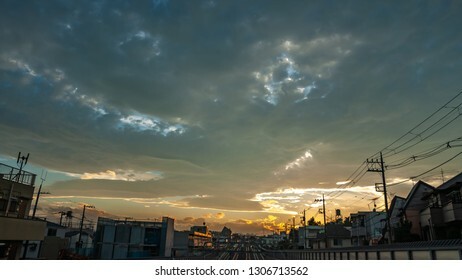 Landscape photo showing the beautiful sunset scene with dramatic clouds and multiple tracks on a railway in a typical suburban Japanese neighbourhood in the city of Tokyo in Japan. 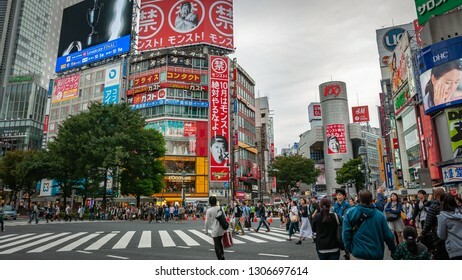 TOKYO, JAPAN - OCTOBER 10, 2016: Crowds of Japanese locals and international tourists crossing at the Shibuya Crossing where the Shibuya Scramble is famous for being the busiest crossing in the world. 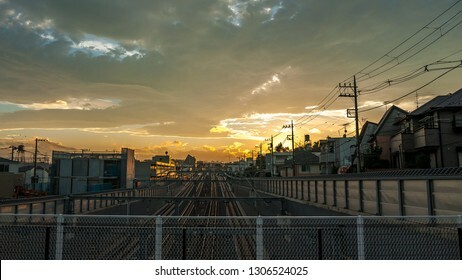 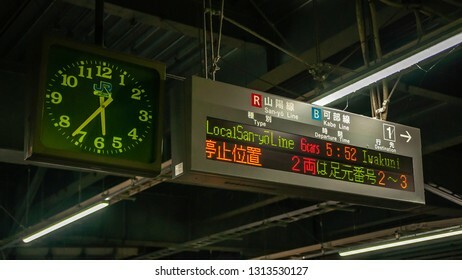 Landscape photo showing the beautiful sunset scene and multiple tracks on a railway in a typical suburban Japanese neighbourhood in the city of Tokyo in Japan. 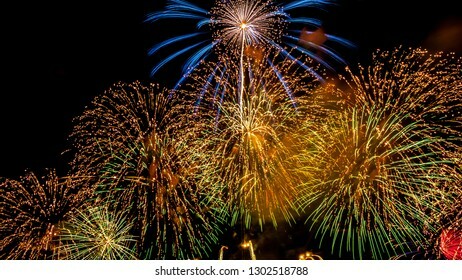 10,000 fireworks launched into the air in Shiga Prefecture, Japan, during the Lake Biwa Great Fireworks Festival takes place where a 1-hour of stunning display of light every summer at Otsu City. 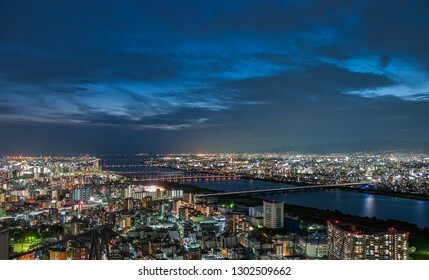 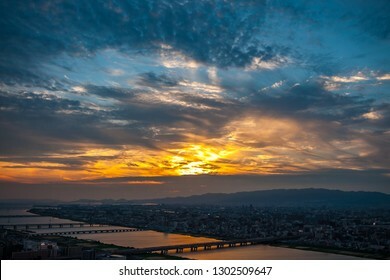 Panoramic, scenic view of Japan's Osaka city from the observatory deck of Umeda Sky Building during sunset with dramatic clouds in the blue and orange sky. 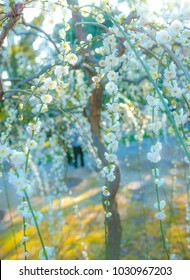 White plum blossoms in full bloom with bokeh background, taken at Kyoto City's Jonangu Shrine in Japan. 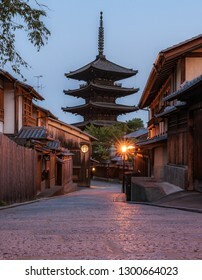 Vertical photo of Yasaka Pagoda which is a five-story pagoda located to the west of Ninenzaka and Sannenzaka streets in Kyoto City's Higashiyama district, during golden hour right after sunrise. 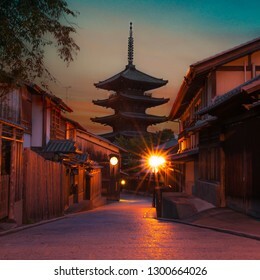 Square-sized photo of Yasaka Pagoda which is a five-story pagoda located to the west of Ninenzaka and Sannenzaka streets in Kyoto City's Higashiyama district, during golden hour right before sunset. 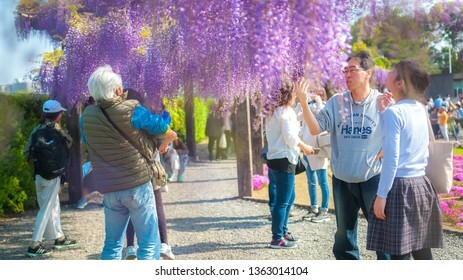 GYEONGGI-DO, SOUTH KOREA - APRIL 29, 2016: Visitors having a stroll in the beautiful 'Garden of Morning Calm' located in South Korea, with pretty flowers and tall trees lining the pavement. 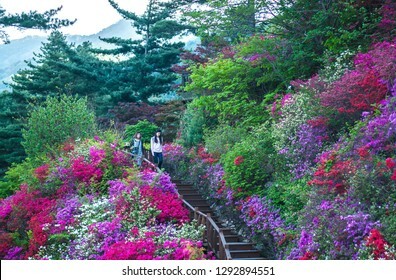 GYEONGGI-DO, SOUTH KOREA - APRIL 29, 2016: A couple of Korean women walking down a long flight of steps with colourful flowers and plants surrounding the staircase in the "Garden of Morning Calm". 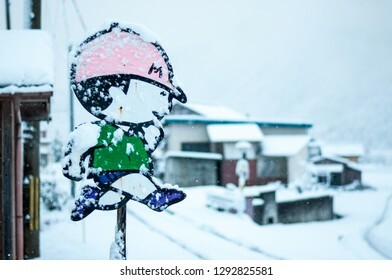 KYOTO, JAPAN - FEBRUARY 7, 2016: Typical street sign in Japan where cartoon drawings of a Japanese boy and girl are used to warn drivers of Japanese elementary schoolkids crossing the road. 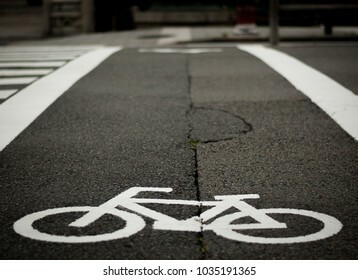 Bicycle sign on the road used for pedestrian crossing. 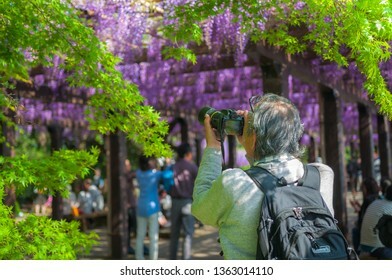 KYOTO, JAPAN - APRIL 15, 2017 : Beautiful spring scene as seen from the top of Keage Incline, which is famous and popular for beautiful cherry blossoms along railroad tracks. 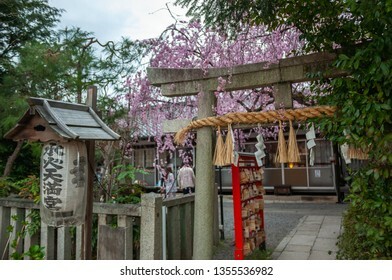 KYOTO, JAPAN - APRIL 6, 2017 : Beautiful spring view with a stone torii gate and cherry trees in full bloom in the background, seen at Suika Tenmangu Shrine. 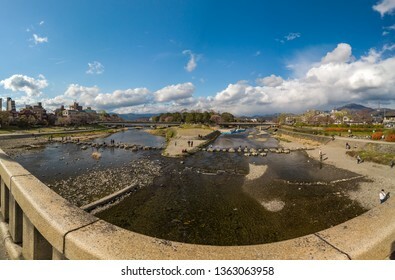 KYOTO, JAPAN - MARCH 31, 2019 : Panoramic photo of Kamo River at the point where two rivers merge into one, taken from the Kamo Ohashi Bridge near Demachiyanagi Station. 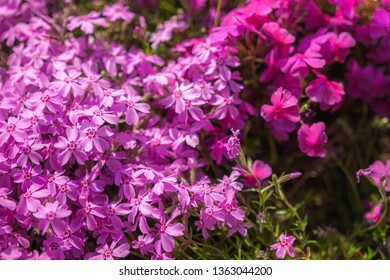 View of purple-coloured Creeping Phlox, or also known as Phlox Stolonifera, which is a herbaceous, stoloniferous, perennial, plant, seen in Kyoto's Toba Sewage Treatment Plant. 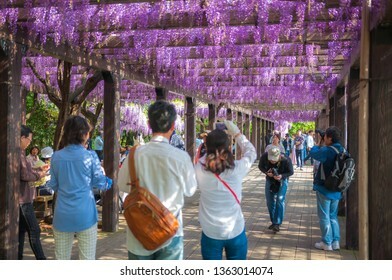 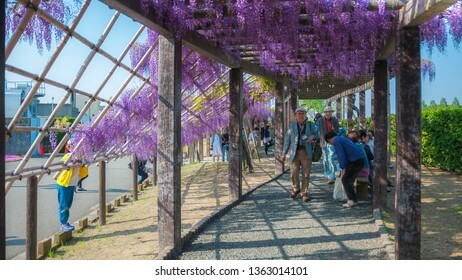 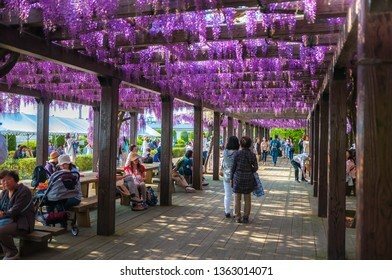 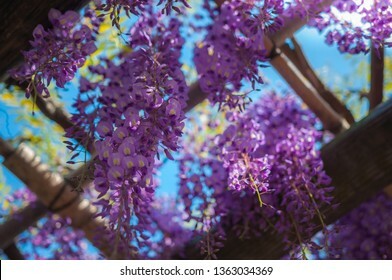 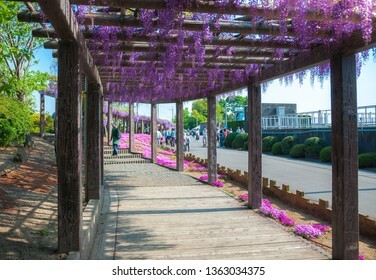 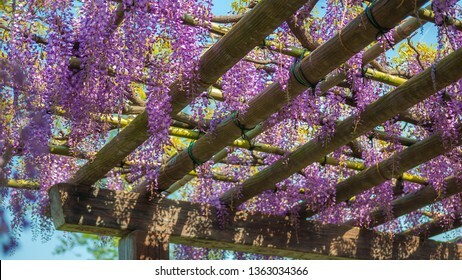 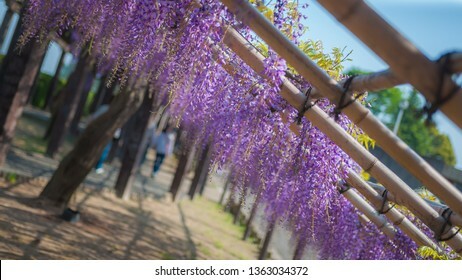 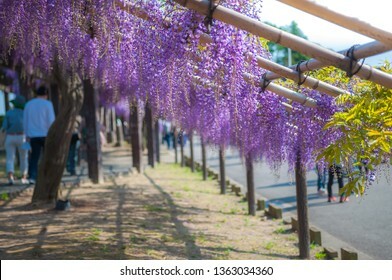 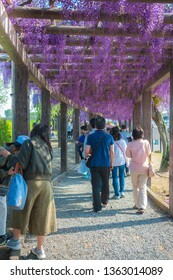 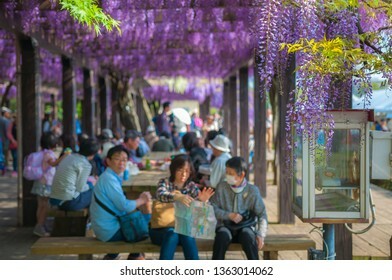 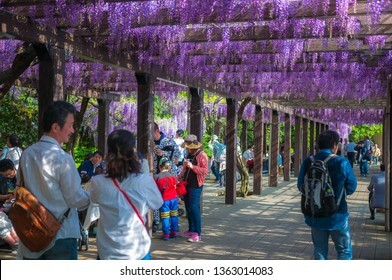 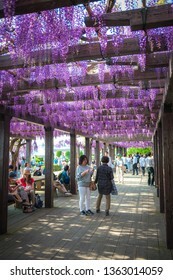 Every year, Toba Water Treatment Plant, located in Japan's Kyoto City, is specially opened to the public in the spring season for people to enjoy its 120 meter long wisteria trellis. 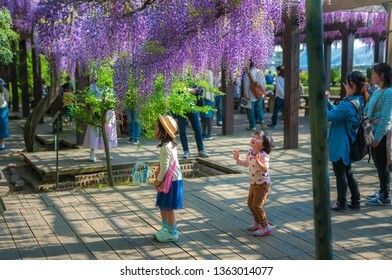 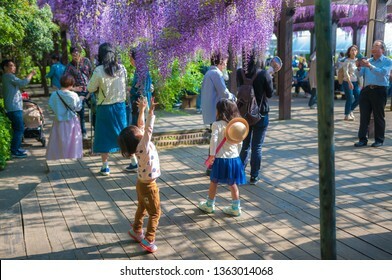 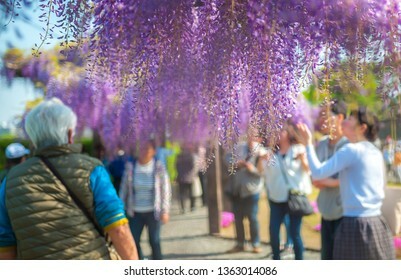 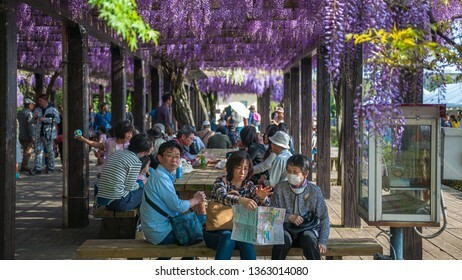 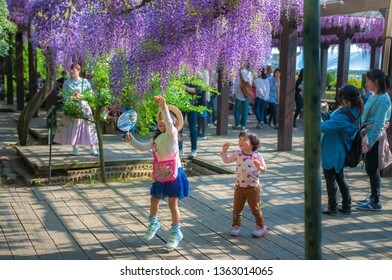 KYOTO, JAPAN - APRIL 30, 2017 : Families and tourists visit Toba Water Treatment Plant, which is opened to the public during springtime for people to enjoy its 120 meter long wisteria trellis. 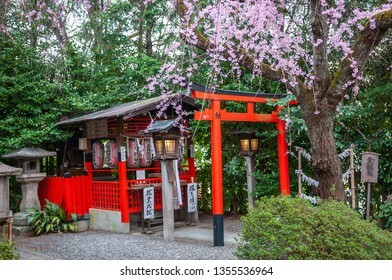 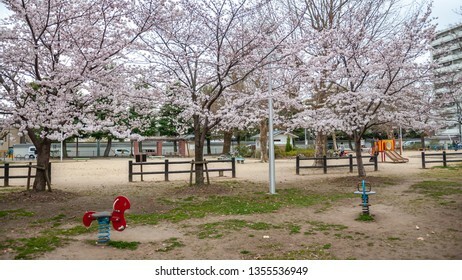 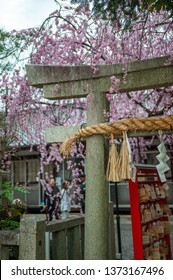 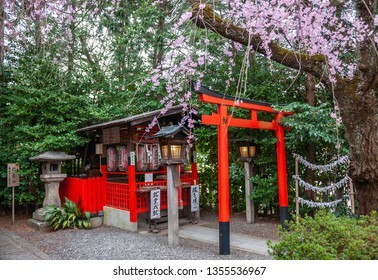 Beautiful spring view with cherry trees in full bloom, seen at a children's playground right beside Suika Tenmangu Shrine in Kyoto City, which is the first Tenmangu Shrine in Japan. 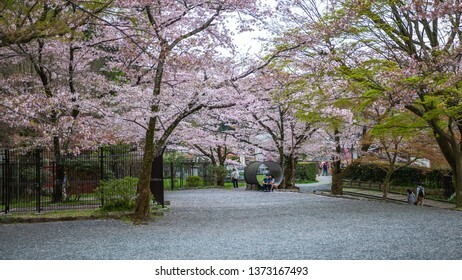 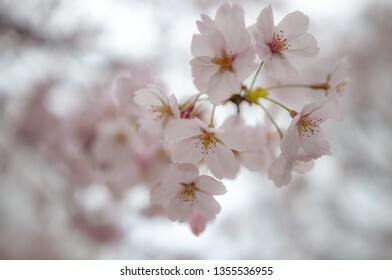 Beautiful pink cherry blossoms with soft bokeh background, seen at Suika Tenmangu Shrine in Kyoto City, which is the first Tenmangu Shrine in Japan. 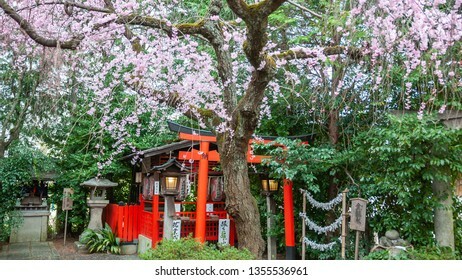 KYOTO, JAPAN - APRIL 6, 2017 : Beautiful spring view with cherry trees in full bloom, seen at Suika Tenmangu Shrine in Kyoto City, which is the first Tenmangu Shrine in Japan.